Consumer World: What Grade of Beef is that Restaurant Steak? Consumer World is a public service guide with over 2000 of the most useful consumer resources. WHAT GRADE OF BEEF IS THAT RESTAURANT STEAK? (BOSTON) -- Do you know what grade of beef that steak is from your favorite restaurant -- select, choice, or prime? You probably don't because most restaurant menus give you a bum steer by keeping some or all quality grades secret. That's the conclusion of a review of menus from 17 national restaurant chains released today by ConsumerWorld.org. Over 80% failed to disclose the grade of beef on their menu for some or all steaks. The grade of filet mignon -- the Cadillac of steaks -- was never disclosed on any menu. Every high-end restaurant failed to disclose the grades of one or more cuts of steak. Only three casual dining restaurants disclosed the grades of all the steaks they serve. "Restaurants are very happy to boast on menus when they use the highest grade of beef -- prime," commented Consumer World founder Edgar Dworsky. "But when eateries don't disclose the grade, that forces diners to play ribeye roulette. Whether you are paying $20 or $60 for a steak, restaurants should cut the bull and tell you what you're getting for your money." 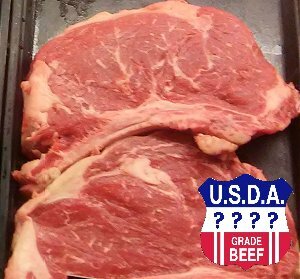 The United States Department of Agriculture (USDA) has three grades of beef commonly found in restaurants: select, choice, and prime, but restaurants are not required to disclose them on their menus. Grading of beef is voluntary and is determined by government inspectors who evaluate the degree of fat marbling, color, and the age of the animal. Grades matter because higher grades of meat are more tender, flavorful, and juicy. The highest grade of beef, prime, which represents less than two-percent of all beef available, is well-marbled and comes from a younger steer. Choice is the middle and most common grade. Finally, select is on the lower end of the retail grading scale and is less marbled, tender, and juicy. Cooking methods and tenderization techniques, however, can enhance the flavor and tenderness of all steaks, even select. The public is less aware of beef grades today as they are rarely taught in school anymore and missing from many menus. 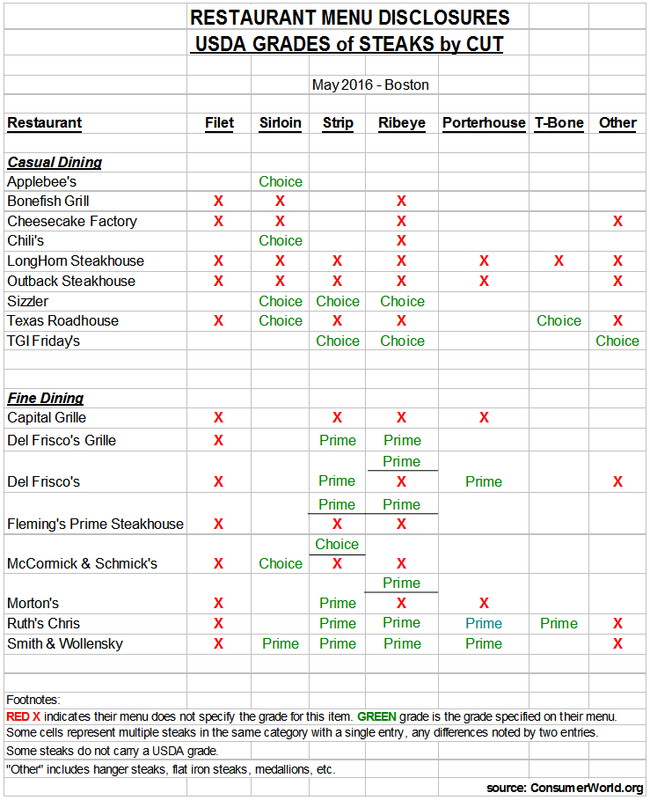 In May, Consumer World reviewed the menus of 17 national restaurant chains in the Boston area to see if the USDA grade was disclosed for each steak cut they offered. Most of the restaurants' media representatives ignored or refused requests to provide additional information about any missing grades. The attached chart lists the grade of each steak when it was identified on menus, and notes the steak cuts where no specific grade was disclosed. The menus checked may or may not be the same ones the chains use at all their locations. In casual dining restaurants, most steaks were not identified by grade. Those that were labeled were choice -- the same grade as most supermarkets sell. In "fine dining" establishments, prime steaks were usually identified, but almost half the steaks were not. Combined, over 80% of eateries didn't fully disclose grades. Many results were unexpected. At the high-end Capital Grille, the menu was silent as to what grade any of their up to $52 steaks were. Similarly, at Outback Steakhouse, which devotes two full pages to steaks on their menu, no USDA grade was disclosed for any of them there. Are these omissions mere oversights? Only three chains -- Applebee's, Sizzler, and TGI Friday's -- disclosed the grade of beef used for every steak on their menu, though only Applebee's integrated it into each steak's description. That chain announced on May 16 that it was upgrading all its steaks to choice from the ungraded beef that it previously served. While partial disclosure of beef grades on menus was common, a surprising finding was that every restaurant that offered filet mignon failed to disclose its grade on their menu. On menus in fine dining restaurants, filets were often placed adjacent to prime grade steaks or near boastful prime grade language, potentially leading diners to assume, rightly or wrongly, that their filet steaks were prime as well. Informal chats with some managers, however, reveal that a lower grade of filet is often the preferred type to serve because it is a naturally lean and tender cut, and saves the restaurant money. There are various possible reasons why restaurants don't disclose the grade of all their steaks. The general public's knowledge of beef grades is limited, so some restaurants may feel no urgency to be transparent in the absence of demand. Also, if restaurants do serve a lower grade of beef, that is not a selling point, and disclosure could hurt sales. Finally, by omitting the grade from menus, restaurants can be more flexible about switching grades based on market prices or other factors and avoid menu reprinting costs. Another surprise surfaced in the course of talking directly to restaurants. Employees were generally ill-informed about the grade of steaks they served when the menu didn't disclose it. "Grade A," "top grade," or "butcher's reserve" -- all made-up designations -- were common refrains when they were queried. Even some chefs and managing partners were not always aware of each steak's grade without first checking the actual carton. 1. If a steak's grade is unidentified on a menu, be suspicious. Ask the chef or manager for the grade, and challenge fuzzy responses if terms other than select, choice, or prime are used. 2. Don't be misled by general overall descriptions of the beef served by the restaurant such as "prime" or "angus." If the individual steak is not specifically listed as prime or choice, you better ask. Angus is not a grade. 3. Weigh grade versus price and seek out the highest grade in your price range. 4. Check online reviews because tasty steaks can be prepared from any grade of beef.